Since we've had ducks before, we already have everything we need to raise ducklings. Ducklings are almost the same as chicks with just a few small differences. 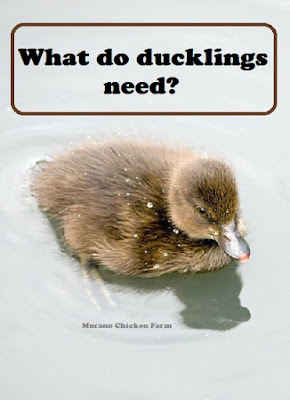 Today, I wanted to talk about exactly what ducklings need and why. Ducklings are obviously going to need a brooder with a heat source, feed, water and bedding. That's pretty much exactly what chicks need so chances are that if you've raised chicks, then you already have most of it on hand. They also might need a special water dish and niacin supplements, and maybe a swimming area but that should be the only differences. Maybe. Ducklings require about the same brooder setup as chicks do with one exception, you'll need to clean it out a lot more! When you're picking up supplies, get twice as much bedding as you would for chicks. You're gonna need it! I use large pine shavings for my duck brooder, but straw works just as well. In the first week of life ducklings need their brooder to be about 95°F. Make sure the brooder is big enough so that they can get away from the heat source if they're hot, or lay under it if they get cold. As each week passes, you'll want to lower the temperature in their brooder about 5°F by either moving the heat light further back, getting a lower watt bulb, or raising the heat plate of the radiant heater. Keep an eye on the ducklings to make sure they look comfortable....not huddle together for warmth nor spread out to the farthest ends of the brooder to get away from the heat. Adjust heat source as necessary. Ducks need a deep enough water bowl that they can get their whole bill in it. They blow out through their nose holes to dislodge any food that's stuck, and they need to submerge their faces to do this. I use a dog water bowl from the dollar store. Make sure the water bowl is not deep enough that they can't get out though, as they will climb in it! Ducklings without a momma duck aren't yet waterproof and can drown, so they can't have a deep water source in their brooder. Ducklings drink a lot of water, but they also waste a lot of water which is why you're going to need all that bedding. Unfortunately there is no way around this. They will need access to water all day long and as soon as they're done drinking it, they start playing in it. If it's warm enough that you can put the ducklings outside on grass for part of the day, then this won't be as much of a problem. If they're stuck inside under a heat source, prepare to clean up a lot of water. Make sure you get non medicated feed. I buy the poultry grower/finisher for my ducklings which is 15% protein. Ducks eat a lot more than chicks and the 20% protein chick starter has too much protein in it for them. They can develop a condition called angel wing which causes one or both wings to twist outward from the body instead of laying flat. Now here's the part to remember: 20% protein chick starter is ok for the first two weeks, but after that you must switch to a lower protein food. Do not feed layer feed, they still need starter. Do not get medicated chick starter. Ducks do not get coccidiosis which is what the medication in medicated feed is meant to treat. Not only is it unnecessary, but since ducklings eat so much feed they will get too much of the medication and that is not safe for them. It'll say right on the bag of it's medicated. A shallow bowl will work for the feed. I don't like to use the chick feeders with the holes on the top, but they will work just fine. Ducklings are going to make a mess in their food no matter what type of container you use, so might as well use something that's easy to clean like a bowl. Brewers yeast: Ducks need more niacin than chicks do, so chick starter feed (or even gamebird starter) is not going to have enough niacin in it. I use powdered brewers yeast and add a heaping tablespoon of it to their food for every cup of feed. Niacin deficiency in ducks can cause the legs to grow outward into a bowed appearance which makes it difficult to walk. I've never seen a bag of duckling starter feed in any of the feed stores near me, though I have heard rumors that it exists! If you can find duck starter then there is no need to worry about protein levels and niacin deficiency. If you cannot, then you'll have to read labels and do some calculations to figure out how to feed your ducklings. If you absolutely cannot find a lower protein starter, you can grind up whole oats and add that to the starter feed plus give lots of treats like peas, lettuce and chopped kale. This is harder though because you're estimating how much to add in and there is obviously room for error. Provide grit if you're supplying them with treats. Here's the fun part! Ducklings can swim when they are very small, and it is the cutest thing possible! However, they are not yet waterproof. If they have a mama duck, she will transfer the oil from her oil gland to the duckling when she preens it and this is what makes water roll off their backs. Without that oil the water will soak through their down coat. If left alone in water a duckling can drown. They can also become chilled since the water soaks down to their skin. It's ok to let the ducklings swim for a short amount of time while supervised, but you must watch that they don't get waterlogged or exhausted. You'll also need to make sure they can dry off and warm up right away as being chilled for too long is bad. I let the ducklings swim in a shallow pan of lukewarm water for about 5-10 minutes. I'll blot them dry with a towel before returning them to the brooder where they will attempt to groom themselves. So cute! We chose Khaki Campbell ducks again. They've been the easiest duck to raise so far. They are a medium weight duck that lay well year round. Their size is smaller than a Pekin, but larger than a Mallard. Khaki's have a slight upright stance, but not as much as a Runner duck. They are a even brown color except for the males who have darker coloration on their heads. Plus, they can fly. I find call ducks and Khaki's are both really happy ducks that are easy to raise and we love having them around. My friend Anna wrote about How to Raise Friendly Ducks, which is the method we've also used for raising our ducks and we've always had great success with it. As much as I'm not looking forward to the brooder mess, I really do love having ducks...and like I said, that pond and coop are just sitting there empty. Want information on raising chickens, guineas and other poultry sent right to your email weekly? Click right here to join my list and get new posts sent directly to you the day they're published ... plus, you'll also get the free download '25 Ways to save money raising chickens'. All great advice! I think ducklings are even more hardy than baby chickens, they just seem to be more easy going about temperature. Placement of water is so important. I actually lost a couple to dehydration because I had placed the water on a 2x4 to keep the bedding out of it. I added another waterer at floor height and everything was good again. Also the protein/angel wing issue - so important to be aware of. Thank you!